“As a community of researchers, funders of research and wider partners of the research produced, we need continually improve how we work together for better outcomes to address the complex natural resource challenges that affect us all. The organisers of a workshop in which organisations from all across the UK came together to discuss better collaboration when tackling interdisciplinary research have published a body of guidance notes, intended to supply advice and help researchers, partnerships and funders achieve better outcomes. 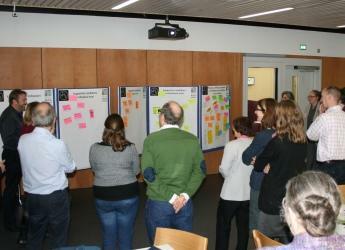 The workshop, titled “Working Together for Better Outcomes”, saw the James Hutton Institute join forces with the Macaulay Development Trust and other partners to enable funders of research, leading international researchers and wider users of research outputs to look at common problems from different perspectives. Professor Gabriele Bammer, from the Australian National University and founder of the international network ‘Integration and Implementation Sciences’, spent a week working with the workshop organisers and participants to share interdisciplinary expertise and to connect with leading interdisciplinary researchers in the UK. Participants in the workshop included representatives from Birmingham City University, Stockholm Environment Institute, University of York, Biotechnology and Biological Sciences Research Council, University of Edinburgh, James Hutton Institute, University of Abertay, Scotland’s Rural College, University of Aberdeen, Macaulay Development Trust, Scottish Government, Natural Environment Research Council, Scottish Natural Heritage, University of Dundee, University of Leeds, Scottish Water, Cranfield University, Scottish Environment Protection Agency, Agrii and Royal Society for the Protection of Birds. The guidance notes were recently featured on Professor Bammer's Integration and Implementation Insights blog.